Some tiaras are indelibly associated with a major event in a royal woman's life. 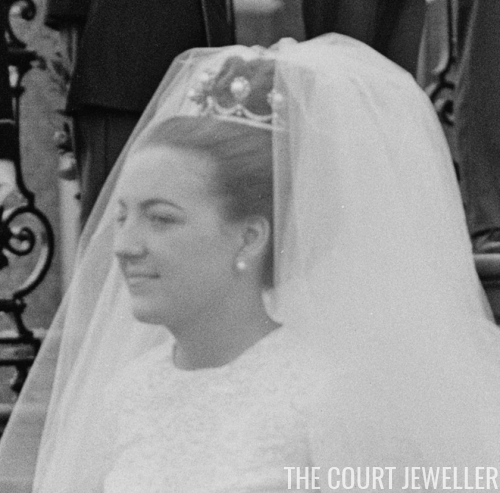 Many of those occasions are royal weddings, but for some lucky royal ladies, they get to choose one of their tiaras to wear for their coronation ceremonies. 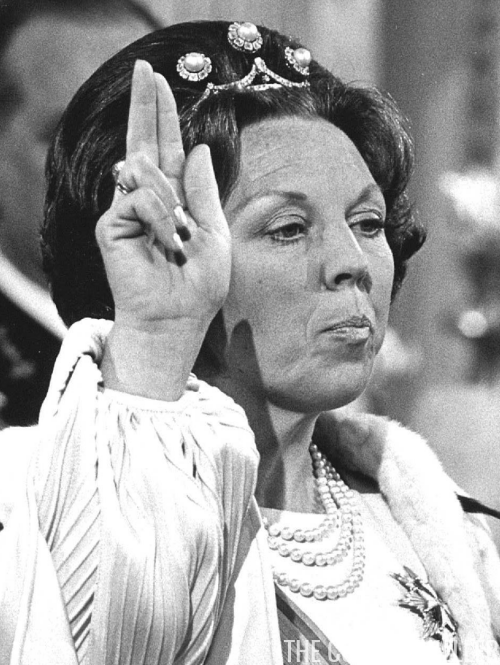 When Princess Beatrix of the Netherlands was invested as queen, following the abdication of her mother, she chose the family's pearl button tiara. The tiara, as per its name, is made of five pearl and diamond buttons placed on a diamond base. The buttons are sometimes referred to as "floral" in design, and indeed, the diamond design surrounding each large pearl does resemble the petals of a flower. These button elements started out as brooches, worn in the nineteenth century by Queen Sophie. Some have argued that the festoon base of the tiara was originally part of a coronet also owned by Queen Sophie (who born a princess of Württemberg), but the tiara as we know it today was not worn in public until the middle of the twentieth century. It was first worn by Queen Juliana in 1965. Since then, it has become a favorite piece of the Dutch royal women, who have trotted it out on some major occasions. 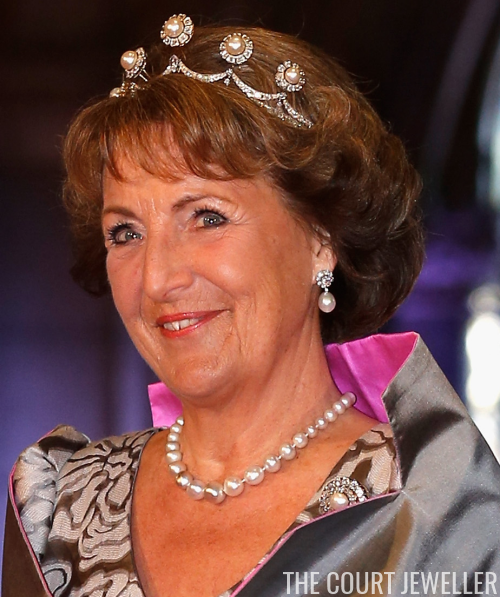 Besides Queen (now Princess) Beatrix's investiture, the tiara was also worn at two major royal weddings: that of Princess Margriet and Pieter van Vollenhoven in 1967, and that of Prince Willem-Alexander (now the nation's king) and Máxima Zorreguieta Cerruti in 2002. 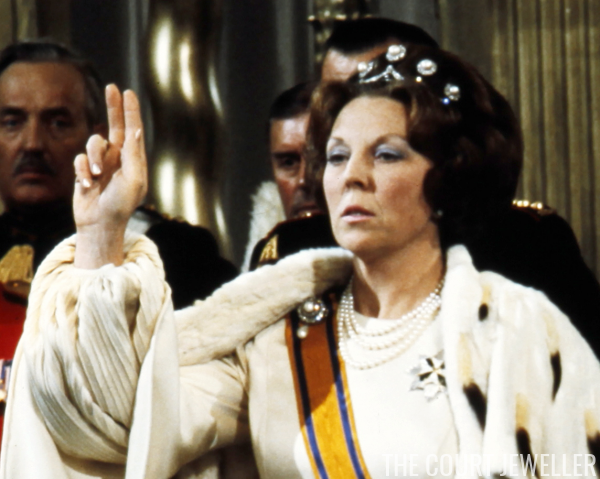 Margriet wore the tiara with the buttons; however, Máxima substituted five of Queen Emma's diamond stars for the pearls. 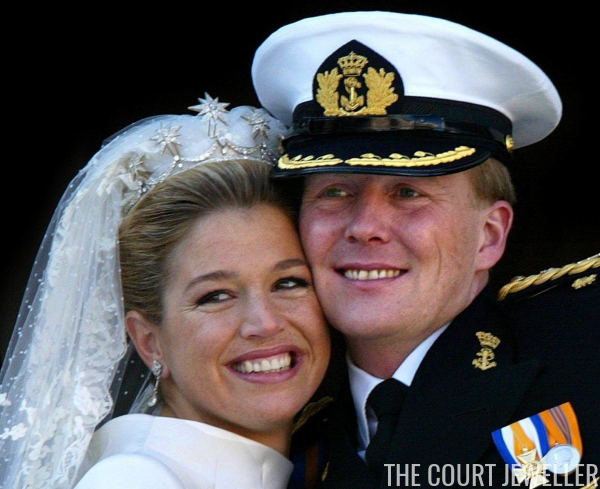 Since then, Máxima has worn both the star and pearl versions of the tiara, while Beatrix and Margriet stick with the classic pearl version. The tiara is simple and looks quite easy to wear, so it wouldn't surprise me if this is one of the first tiaras worn by the current Princess of Orange, Catharina-Amalia, when she begins attending state events. Note: this is a version of an earlier post that has been updated with new text and/or images.